For a limited time we're bundling our new single "Tumblin' Down" with our debut album Wichita and letting you pay what you want! Enjoy! 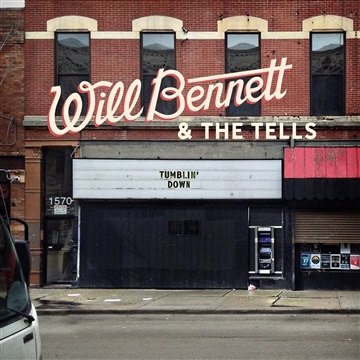 Will Bennett & The Tells’ rollicking new single “Tumblin’ Down,” out April 14, 2017, showcases the band’s biggest strengths: infectious, sharp-witted songwriting brought to life with the bottled-up urgency of a tight four-piece being captured in the studio. The result is a sound that will resonate just as well with fans of The Replacements’ literate barroom rock as those of cowpunk stalwarts such as the Old 97’s and Lydia Loveless. Clocking in at just over two-and-a-half minutes, “Tumblin’ Down” bounces with the energy and exuberance of early-Sixties rock & roll. The unapologetically catchy stomper marries Isley Brothers-inspired harmonies, jangly guitar work that hearkens back to vintage Peter Buck, and a muscular country rhythm section that never loses the band’s trademark shuffle. At it’s heart, “Tumblin’ Down” is a love song, an ode to the manic highs of long-distance romance as well as a eulogy for one of Chicago’s most storied venues: (“We’ll slide across the floor at the Double Door / Until the music stops and we yell for more”). Will Bennett & The Tells formed in 2014 when the singer-songwriter packed up his guitar and left his hometown of Grinnell, Iowa for Columbus, where he joined forces with drummer Daniel Martinson. “Tumblin’ Down” sees Alan Gabrenya taking over the reins on lead guitar for Josh Zimmerer, whose departure to Wichita inspired the title for the band’s first record, and Sean Jones rounding out the quartet on bass. The band’s debut album Wichita, released in 2016, garnered high praise from variety of genre tastemakers, ultimately landing at #40 in the No Depression Year-End Readers Poll and earning a spot on Americana Rock Mix’s “Best of 2016” podcast.